The University of California Humanities Research Institute (UCHRI) has announced a number of grant opportunities available to UC tenure-track faculty members and graduate students. Grants will be awarded for such activities as research residencies, seminars, conferences, public humanities projects, fellowships and scholarships. The grants will be awarded in 2015. Application deadlines begin in December. A list of all nine UCHRI grants and two related grants are listed online. For more information, visit http://uchri.org/uchri/funding-overview-and-calendar/. the effects and consequences of virtual worlds and other cyber-spatial environments in which death is an ever present but temporary state. The public humanities grants — “Engaging Humanities” — will be awarded to scholars who propose innovative projects that combine humanities research and/or pedagogy with community engagement, building ties between UC campuses and California communities through research engagements and/or partnerships with community organizations, museums, non-governmental organizations or other public-facing groups. The University of California Humanities Research Institute was founded as a multicampus research unit of the UC Office of the President under the UC Humanities Initiative, established by former UC President David P. Gardner in 1987. In 2009, a new UC Humanities Network was developed and funded by a five-year grant from the UC Office of Research and Graduate Studies, incorporating and expanding the original Humanities Initiative. The Network links UCHRI, a refashioned Humanities Advisory Committee, and a new UC Consortium of Humanities Centers into a dynamic new structure and vision for multi-campus engagement and collaboration. Based on the UC Irvine campus, UCHRI serves all ten campuses in the UC system, interacting with UC campus humanities centers, other campus research centers, and with individual faculty to promote collaborative, interdisciplinary humanities research and pedagogy throughout the University of California system and within the larger communities they inhabit. 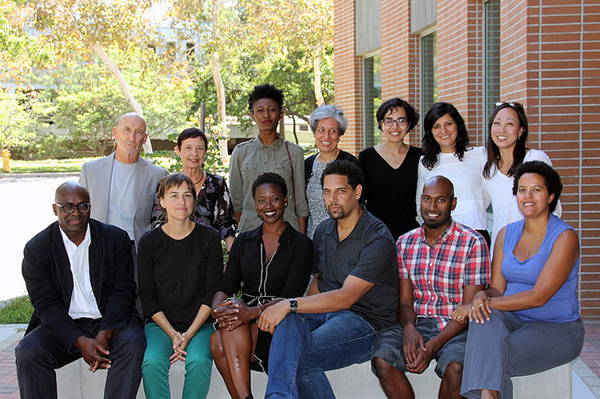 Banner image: David Theo Goldberg, back row at left, with UCHRI grant awardees from 2014.